On the 30th May, around 150 people from the village of Al-Ma’sara demonstrated against the building of the apartheid wall on their land. As usual the demo started from the middle of the village ad continued towards the construction site where the Israeli army are building the wall. The majority of the participators were from the village and were joined by a group from the Anarchists Against the Wall and members of the Christian Peacemaker Teams (CPT). As the demonstration reached the entrance of the village, Israeli soldiers closed the entrance of the village with razor-wire. 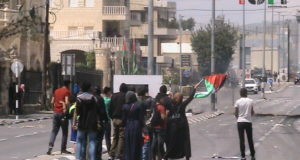 Protesters tried to remove the wire in order to continue to reach the land of the village, but the soldiers attacked them. Two of them were injured and moved to a near clinic to be treated. 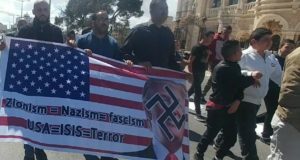 After that the Israeli soldiers arrested two people, one from the Israelis and the other from the USA. Then Mahmoud Zwahre, director of the Popular Committee Against the Wall in Al-Ma’sara village, made a speech about the Palestinian Justice Day. He pointed to all of the faces of the occupation in Palestine, especially in Al-Ma’sara village, making clear that the occupation has developed a policy of apartheid and declaring a ‘Summer Against Apartheid’, that will start next week. Then another speaker from the village Popular Committee talked about the behaviour of the Israeli solders against civilians, made clear when the soldiers fire sound bombs at the protesters. He also focused on the future situation of the village after the wall and the effects of the wall on the area. He then asked all of the internationals and local people to participate in the next demo which will take place on the 6th of June on the anniversary of Naksa . After that a group of the participators a Christian group conducted a special prayer in front of the wire and soldiers asking for peace. By Ghassan Bannoura, published by IMEMC on the 30th May 2008. Villagers from Bil’in, located near the central West Bank city of Ramallah, supported by international and Israeli peace activists conducted their weekly nonviolent protest against the illegal Israeli wall built on the village’s land on Friday. 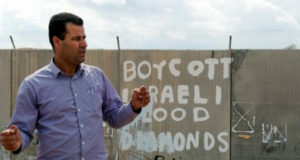 The villagers called for the removal of the of the Israeli wall, settlements. Like every week the protests started after the mid-day Friday prayers were finished in the local mosque. Protesters marched towards the location of the Wall which is separating the village from its land. Immediately after the protest reached the gate of the Wall, soldiers showered the protesters with tear gas and rubber-coated steel bullets. Scores of protesters were treated for gas inhalation, and three were injured by rubber-steal coated bullets. Iyad Burnat of the local committee against the Wall and Settlements said that the soldiers used a new army vehicle that fires tear gas at protesters. “It can fire 30 gas bombs in one go.” Burnat told IMEMC. Around 200 villagers from Al Khader village near Bethlehem, in the southern part of the West Bank protest on Friday the Israeli wall and settlements constructed on the village land. Supported by 50 international and Israeli peace activist the villager held the midday prayers on the settlers road near the village then marched towards the nearby Israeli road block. Several hours later the action was finished peacefully. A number of the village activists today took a group of internationals who took part of today’s action for a tour on the village land that is annexed for the wall and the Israeli settlements.